Welcome to Oceansview located just 30 minutes north of El Altet, Alicante Airport, Costa Blanca, Spain in a stunning location over looking the Mediterranean and the town of San Juan. This luxurious property offers the discerning holiday maker, executive or family the finest facilities available on the coast of the Costa Blanca. 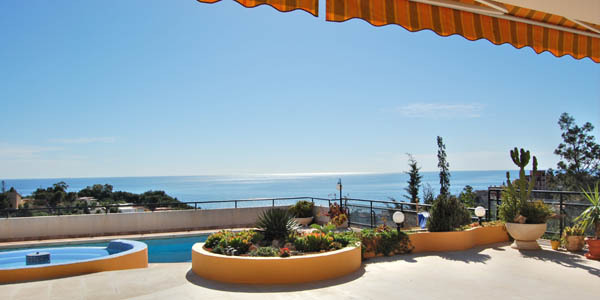 This beautiful villa sleeps up to 16 people and pets are allowed at the owner´s discretion. Oceansview offers you total privacy, the very best views, championship golf courses, trams to and from Alicante or Benidorm, first class accommodation with Jacuzzi, sauna and large pool and accommodation for any staff. The Costa Blanca is famed for it's beautiful beaches, the beach at Coveta Fuma just a five minute walk away is no exception with white sand and crystal clear waters many a day is spent just watching the hours slip by. This website offers you the opportunity to visit this property from the luxury of your office or home by way of a guided tour. Just make sure you visit the terrace and pool area to see what fantastic views Oceansview Villa offers, and imagine yourself soaking up the sun and wallowing in the luxury that this villa offers you.